Assertion is showed in GUI window. Can you try with a clean profile? If you don't see the bug while using a clean profile, please try to figure out what extension(s) or other settings are necessary to trigger the bug. The only addons I have installed are the various language packs that ship with Fedora Linux 9. It appears from the message that some file Firefox uses has been removed as part of the upgrade. If this is the case, then perhaps assertion failures should not be used as the mechanism to report missing files (after all a file can go away for all sorts of reasons, and an assertion failure indicates a completely 'impossible' condition). Instead if a file is missing the user could be prompted to restart Firefox. I have seen this several times since reporting the bug. It does seem to occur when Firefox is upgraded while it's still running. I haven't tried to reproduce it, but in general, surely assertions should not be used to check for missing files? An assertion should be an impossible, 'cannot happen' condition based on program logic, not something that checks the state of the world external to the program. After all filesystems can be unmounted, files can be deleted, and while this is certainly an error condition it is not an impossible condition. I suppose you could talk to the Fedora guys about what is the supported way to upgrade Firefox, and if the user should be prompted to restart the browser when a new rpm package is pushed out. Did you restart Firefox after updating? At this moment, this bug doesn't affects me, upgrade and full reboot of my computer helped to get it work. I assume, it were happened, becouse other firefox copy has been started in background that downloaded files (this behavior is achieved with extra addition to firefox), but i'm not sure about it. Anyway, i think i t will be better to avoid such thing's during updates of system. It really bad when updates are run in backgorud, and such errors halt your work. If any more information is nessary, feel free to ask me for it. This is a dupe of Bug #299393. I'd mark it as such, but apparently I don't have adequate privileges to do that, given that several other bugs are marked as duplicates of this one. Can someone please mark this as a duplicate of bug #457434. Added link to upstream bug. To summarize the upstream ticket, the problem is a side effect of the version upgrade process. Restarting FF will work around the problem. I'd infer from that, that the problem lies in the packaging, and not with the upstream project. One of the duplicate tickets here contains a developer comment stating that this isn't an easy problem to resolve. Although the current upgrade process does include a user notification that a FF restart is required, maybe a stop-gap solution would be to make that notification more forceful and intrusive, prompting the user to restart FF immediately before continuing to use it. as a duplicate of the bug we have tracking. Update title to better fit it and hope to catch all this bug to this one. I too have observed this problem several times. For me, the problems occurs at every firefox upgrade. It looks like a packaging problem. When firefox is upgraded with apt-get, a firefox restart is required. But *between* the upgrade and the (firefox) restart, firefox behaves abnormally. It is not always practical to restart firefox immediately, e.g. the user might be writing an email or filling in a form. Errors include: assertion failed when a URL is entered in the URL bar, right click not giving context-sensitive menus (e.g. save image when over an image). Expected behaviour: Firefox should continue to work normally. This happened to me after accepting today's update, and restarting firefox has not helped. What is more both help-about and edit-preferences produce an empty window of size zero. I get a tiny border of zero width and small height, and when stretched to a reasonable size it has no contents. lets use this as the main bug to track progress on firefox integrating with packaging system. This probably will take some time, so don't expect a fix to happen anytime soon. To workaround you have to restart all firefox instances; unfortunatly only way for users to be sure that you really restarted firefox is to relogin or even reboot. Further to the above report, running killall firefox and restarting did not resolve either issue, but rebooting the machine appears to have done so. I am out of the office until 13/08/2009. [MASTER] Update to Firefox causes errors" sent on 8/9/09 10:11:09 PM. faster. 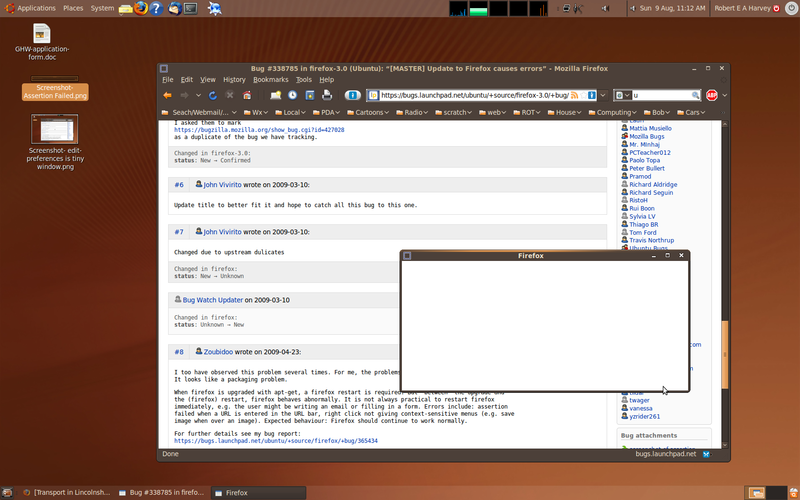 I have been running it without problems on Ubuntu 9.04. > firefox has not helped. > height, and when stretched to a reasonable size it has no contents. > ** Attachment added: "screenshot of assertion"
> Assertion is showed in GUI window. > ASSERT: *** Search: _installLocation: engine has no file! As given by bug 466278 this happens when a search engine file has been removed/renamed while Firefox is running. As stated by Gavin it's a bug in the search service. Sorry but Firefox-3.0 has reached EOL and will not get this fix. 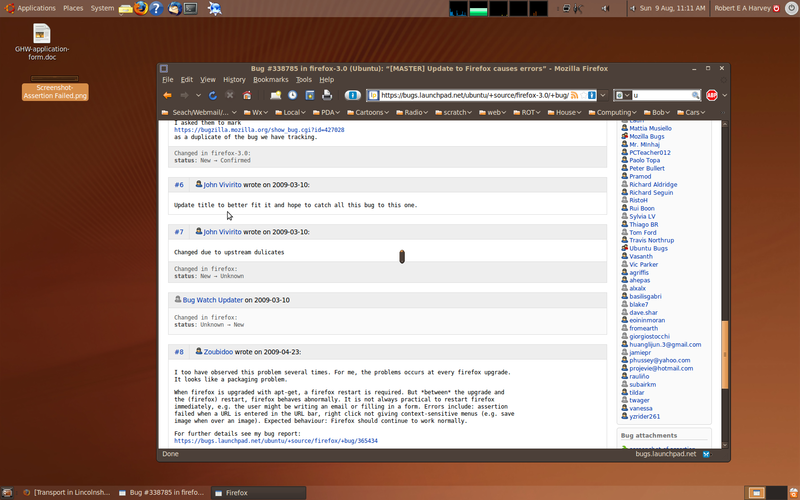 Closing as 3.0 under a supported Ubuntu release will be updated to latest Firefox from now on. I'm wondering if this bug title should be more accurate. It says ....various problems until restart. So far from what i see its more of the assertion errors. Added a task for Thunderbird, too. The symptoms for Thunderbird are somewhat different; perhaps it should be a separate bug. Also xulrunner (and anything using xulrunner) is probably affected, too. @bug-control: Please set this bug back to triaged. Thanks. @celerino: This bug isn't fixed. Please don't change the bug status unless it's really fixed upstream. Thanks.